These bite size cheesecake morsels are so festive for your holiday table. They are easy, delicious and your guests will love them! Beat all ingredients except for the coconut & chocolate in a large bowl until combined. Roll 2 tablespoons of mixture into balls and place on parchment lined baking sheet. Repeat process for remaining cheesecake and refrigerate for at least 2 hours to set up. 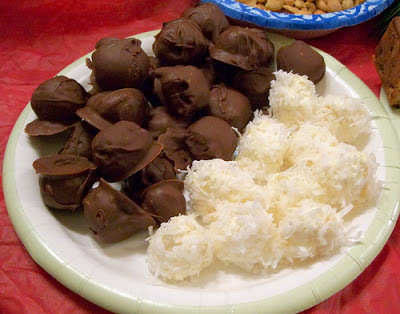 Roll balls into coconut or drop into melted chocolate. If dipping in chocolate, place on a sheet of parchment paper after till chocolate is firm. Store in the fridge. why no suger beat in the mix? What do you do with the sugar? Sounds like something I could make with Splenda or Truvia. But I'm confused. Are there 2 kinds of sugar used in this recipe? And if you beat all ingredients 'except powdered sugar', when do you add the powdered sugar? I dont know what the above comments are for but the recipe above is easy to follow and they taste good!